Thank you to everyone who has already donated this year. Batistina Rosa Chavez Garcia lives in Monteria, Colombia with her three daughters and one of her grandchildren. For the past few years, Rosa has managed a convenience store to provide a variety of everyday necessities and grocery items to her community members. It hasn’t been easy for her family, and there was a time when Rosa was not able to afford to meet the daily needs of her daughters and grandchild. Everything began to change for Rosa when she was introduced to Opportunity International. 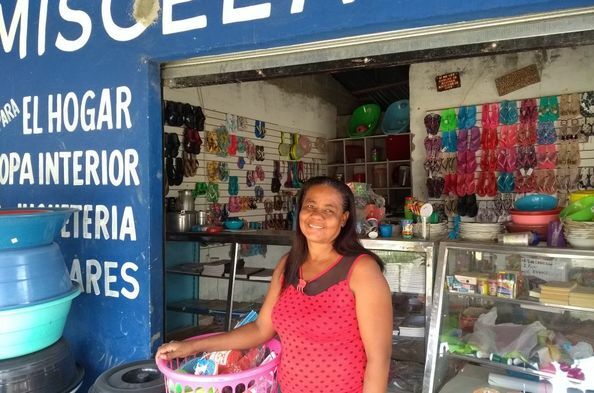 Rosa received financial training and a loan to invest in her shop and purchase inventory in bulk. With more products to sell and a greater diversity of products, Rosa was able to attract new customers and increase her sales. She was also able to use a portion of the loan to purchase two washing machines to add to her shop; which she now rents out, providing a small laundromat service to her community. Looking to the future, Rosa plans on saving enough to travel around the world with her family. Thanks to the loan she received, Rosa will be able to save for her grandchildren’s education and their futures.